You may remember that the May 16 spawning had a difficult start. It's from my trusty brood set that has produced 3 baby champions at open shows, to date. And the actual spawning and rearing over the first few weeks was text book. The problem you may remember was the fry ponds outside became toxic at just the wrong time and we were stuck with a couple of hundred thousand 2 week old fry with no where to rear them. That meant we kicked off our experiments with indoor artificial rearing ... and we ended up harvesting 5-10k of them at first selection. The whole rearing process is totally different to anything we've done before, it took ages for the fry to grow and i've not been all that happy with the way the fry have developed. 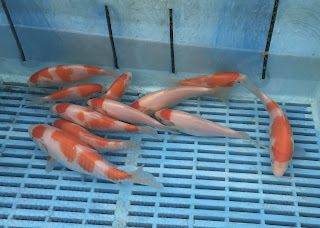 Even though the remaining fry have not been given our best tank... they have nevertheless finally reached a size when we need to select through them again to thin out the tank. Turns out I'd kept more than I thought at the last selection; and we ended up today with around 100 keepers and 200 to move on. The total numbers in such a small tank is one very good reason why growth has been sluggish... today's clear out should act as a catalyst for their next stint. Growth is way behind previous years, but I am hopeful this will right itself now we have an auto feeder on the tank and also the number of fish in the tank has been reduced. 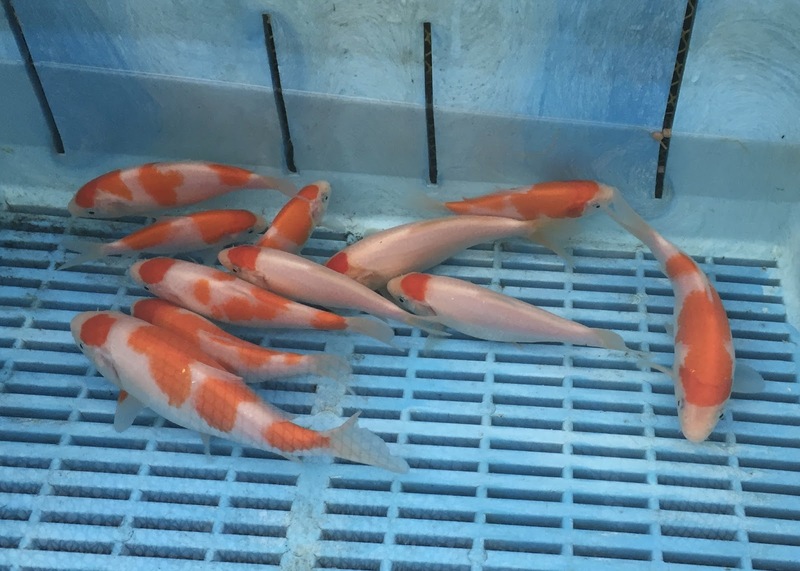 the other thing is that ... focussing on showing koi for next year.. I don't need these to be jumbo fish. just to reach size 1 and 2 by June and that will be fine. tomorrow - we're selecting through the other growing on tank. the babies from the 'sharkey' spawning.